Lodging space is limited in Lubec, and may be in high demand in summer, so reserve your room(s) in advance! Lubec, Maine is a village with a limited number of hotels and inns, so you should reserve your lodgings before arrival. Across the bay in New Brunswick, Canada, the beautiful, historic resort town of St Andrews by the Sea has numerous hotels, inns and motels. Have your passport with you to cross into Canada. 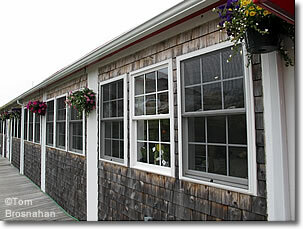 Suites at the Inn on the Wharf, Lubec, Maine.